If there's one thing I've learned from my study of anthropology, it's that people annoy me. A lot. This is more of a place for me to vent rather than an actual anthropological blog. Think of it as my version of Malinowski's journal. If you've read any anthropological blogs in the past couple of days, you're undoubtedly familiar with the American Anthropological Association's newly revised mission statement (a .pdf can be found here) that removes all reference to science. To quote Krystal D'Costa, "The backlash has been immediate." As so many science bloggers have thoroughly analyzed this (see here and here), I'm going to stick to what I do best - the unbridled rant. I've never been a fan of the AAA. Sure, I considered joining when I was an undergrad, but their insistence on ineffectual boycotts, their handling of the Human Terrain System, and they way they bully academic anthropologists into compliance with their hair-brained schemes ensured that I would never give the AAA a dime. And I'm not the only one that feels this way. According to a blog I can't find at the moment and therefore can't cite, membership for the AAA has dwindled in recent years and this latest move isn't expected to bring any more into the fold. 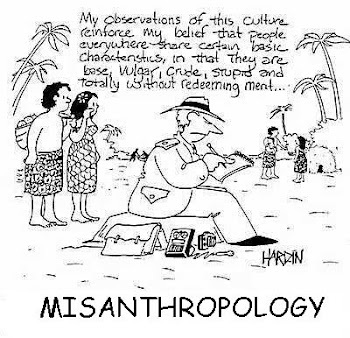 To me, this move to turn anthropologists from social scientists into social philosophers strikes me as yet another attempt to consolidate the powerbase of the AAA in the hands of one particular subset of anthropologists - the so-called "fluff-head" cultural anthropologists. This type of anthropologist is the antithesis of the physical anthropologist and the archaeologist. While the latter types are strongly tied to the scientific methods, the fluff-heads analyze cultures in a method more akin to literary analysis. Now, don't get me wrong, I'm all for interpretive analysis. There's even a picture of Clifford Geertz tacked up over my desk. But we still need the scientific method to keep us grounded. Without science, anthropological analysis runs the risk of being just as pointless and pretentious as an Ayn Rand novel. Also, turning away from empirical research and toward advocacy strikes me as hypocritical given that the AAA's code of ethics seems to be modeled after Star Trek's Prime Directive. Advocacy seems an awful lot like applied anthropology to me, which the AAA has a history of being openly hostile toward. Talk about a group that ignores its own past. I've often said that the rift between science and philosophy that has emerged in the past 300 years or so has been detrimental to both disciplines. That's why I was drawn to anthropology - I, like Eric Wolf, believe it to be a beautiful blend of the sciences and the humanities. However, the AAA seems to be on a clandestine mission to cleave this bond, thereby completely excluding the physical anthropologists, archaeologists, and more scientifically inclined cultural anthropologists. I'm a medical anthropologist who works closely with physicians in a clinical setting. As such, I have been forced to become heavily influenced by the scientific method. The first half of my life may have been ruled by the humanities, but I am a scientist now. My past and my present have made me a better anthropologist and a better person overall. I can see sides of an issue that are often not apparent to many of my staunchly empirical colleagues and I can provide the hard data to back up my theories. If the AAA has its way, I guess well-rounded anthropologists will become a thing of the past. A misanthropic medical anthropologist(SS-55), navy veteran, part-time professor, and world-class curmudgeon. I simultaneously study and complain about the human condition.